Two months after the release of Team Up, it became clear that Lightning decks are in full force. Both Pikachu and Zekrom-GX and Zapdos / Jirachi have their share of wins and placements, both at local and at major events. They are popular, and they are good. Although we see these two decks as separate, I believe they are only parts of a spectrum of Lightning decks. If you’re not convinced, think about some of Pikachu & Zekrom-GX’s matchups: when facing Zoroark-GX / Lycanroc-GX, for example, the deck tends to rely on Zapdos for the early and mid-game, basically acting like a Zapdos / Jirachi deck, since benching a Pikachu & Zekrom-GX would mean giving up three easy Prizes. On one end of this Lightning spectrum, you have pure Zapdos decks, such as the Zapdos / Buzzwole / Nihilego deck that takes full advantage of Shrine of Punishment; on the opposite end, you have aggressive Pikachu and Zekrom-GX decks like the turbo version used by Jose Marrero at the Oceania International Championship. Between the two, there are many variants, such as the Zapdos / Jirachi deck that won OCIC, or the classic Pikachu & Zekrom-GX lists that rely on Jirachi. All of these decks have their strengths and weaknesses, but are united in their use of some of the Lightning type’s strongest tools, such as Tapu Koko Prism Star, Thunder Mountain Prism Star, and Electropower. However, by using Pokémon such as Jolteon-GX , Zeraora-GX and Pikachu & Zekrom-GX, these decks also have an issue with the Fighting-type decks. Given that Zoroark-GX, which is in the best spot it’s been since the beginning of the season, is also weak to Fighting, there’s a strong incentive to play Fighting decks right now. Zapdos does complicate things, though. As a Lightning-type Pokémon that has Fighting Resistance, it prevents decks like Buzzwole / Garbodor from winning through type advantage. 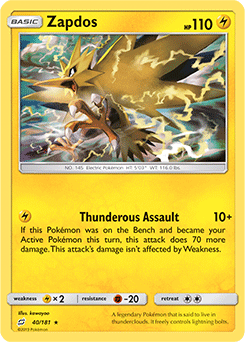 Any deck that wants to rely on Fighting-type attackers to beat Lighting-type decks must also have a way to deal with Zapdos. There are a couple of options, though. In this article, I’ll talk first about the latest cool Lightning variant, and then about some Fighting options to deal with it. While I like running the full four copies of Jirachi to get the best odds of starting with it- something that’s especially important when facing a turn one Let Loose — three are enough for one game and give you more space for other cards. Using Marshadow has proven effective in its spot. It’s especially effective in the mirror match; going second, you can shuffle back the hand your opponent gave themselves after a turn one Lillie, and if you can KO their only Jirachi at the same time, you set them back decisively.